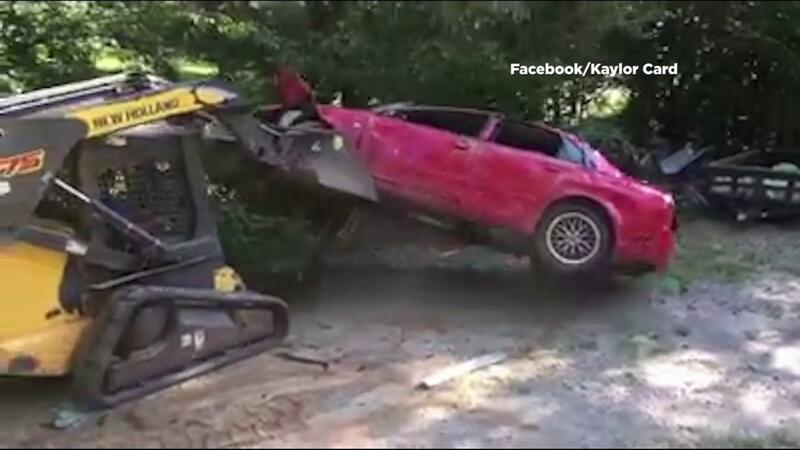 One Georgia father saw his daughter's car rockin', so he came knockin' -- that is, if you consider knockin' to be running the vehicle over with a bulldozer. After Mike Card discovered his young daughter, Ashlyn, "getting it on" with a neighborhood boy in the back seat of her red Audi A4, he went insane, quickly shifting gears from cool dad into furious father. Within 2 minutes, the automobile went from treasure to trash, according to KIAH. But worry not -- neither Ashlyn nor the boy in question were still in the automobile at the time of dad's meltdown. Ashlyn's brother, Kaylor Card, posted a video of the backyard demolition on Facebook with the caption "When a dad has to prove a point! #DaddyNotHappy." And boy, was he not kidding when he said that daddy was not happy. In case you missed it the first time, here's the action again from a different angle. The crazy videos have gone viral since Kaylor shared them, garnering over 380,000 views total and nearly 1,400 shares. Naturally, the videos have also racked up a slew of comments, some by people in awe of Card's parenting style, some by people wondering how short his fuse could possibly be. Regardless of what we think of his disciplinary techniques, all we can say is this -- she probably won't do it again.